The PC925L Odyssey is a 12 volt 925CA/380CCA 28 Ah drycell battery w/ female brass terminals. Odyssey's secret is the use of high purity lead. This allows the battery to put out tremendous cranking power while having the ability to be discharged completely and recharged over 400 times. The pure lead design also is resistant to corrosion and sulfation on the internal plates, the number one cause of battery failure. The Odyssey PC925 is capable of being charged at up to 15.2 volts at 50 amps making for a quick recharge time. 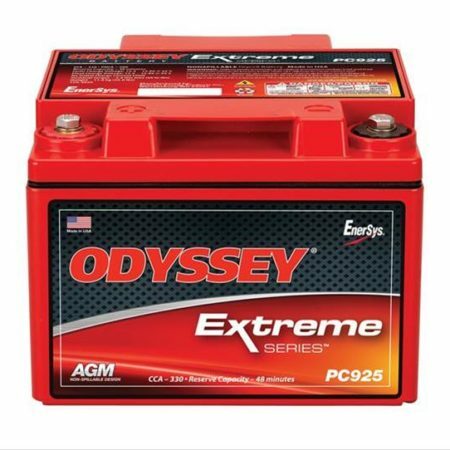 Odyssey batteries can be charged by any conventional 12 volt charger. General use and auto engine start. BMW, Ducati, Moto Guzzi. HD '97 – present FLHR, FLHT, FLTR. The PC925L Odyssey is a 12 volt 925CA/380CCA 28 Ah drycell battery w/ female brass terminals. Odyssey’s secret is the use of high purity lead. This allows the battery to put out tremendous cranking power while having the ability to be discharged completely and recharged over 400 times. The pure lead design also is resistant to corrosion and sulfation on the internal plates, the number one cause of battery failure. The Odyssey PC925L is capable of being charged at up to 15.2 volts at 50 amps making for a quick recharge time. Odyssey batteries can be charged by any conventional 12 volt charger. General use and auto engine start. BMW, Ducati, Moto Guzzi. HD ’97 – present FLHR, FLHT, FLTR. Be the first to review “Odyssey PC925L Drycell Battery” Click here to cancel reply.